For the absolute beginner banjo player, this 75 minute DVD takes you from your first notes to your first solo in an easy, step-by-step manner. It features live stage performances with Gavin Ralston on guitar and Paul McNevin on fiddle. 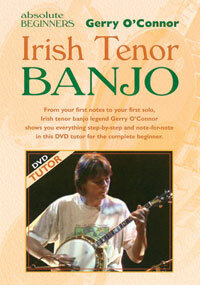 Gerry's unique style of playing has gained him the reputation of being the world's greatest Irish tenor banjo player ever.